Military Outposts (MOs) are used to keep ships from entering a certain area or to collect a toll from passing ships. There is a chance to automatically fly by blocking MOs unnoticed, this chance depending on factors such as the type of the ship attempting to pass and the configuration of the MO. An MO's owner is able to set the level of surveillance (grid strength) for their MO and thus the chance ships are detected and blocked. Big, dangerous ships are easier spotted and blocked by the MO than harmless, small vessels. If you are blocked by an MO, try to contact the owner to gain access, or find a different MO to enter the area. A military outpost can be configured to allow all but foes to pass, or only friends and alliance members, or only alliance members, or to block everyone. In addition, a toll may be required for a different category of people. There is a special option to always allow players under newbie protection to pass. It is encouraged to use this option as military outposts are one of the biggest hurdles for players just starting out, trying to do missions or explore the universe without further knowledge about politics, alliances, geography. Young players able to pass the MO due to this option can be logged. As the owner of an MO you are able to set the surveillance grid strength (0-20) of your MO and thus the chance ships are detected and blocked by it. Tied to this strength is the building's upkeep, the higher the grid strength the higher the upkeep of the MO. If there is insufficient upkeep in your building during the building tick, the grid strength of your MO is either lowered to 0 if enough supplies for this strength are available, or the MO stops to function until the next building tick. MOs of members of warring factions only require half upkeep due to the sponsoring by their faction. Big, dangerous ships are easily spotted and blocked even at low grid strengths, while small and fragile ships require maintaining a high surveillance grid strength for the MO to have a decent chance at detecting and blocking them. Squadrons do not possess the ability to fly by MOs, as is the case with any ships approaching Lucidi MOs. Upkeep costs per surveillance grid strength can be calculated from [REF:Formulas]. 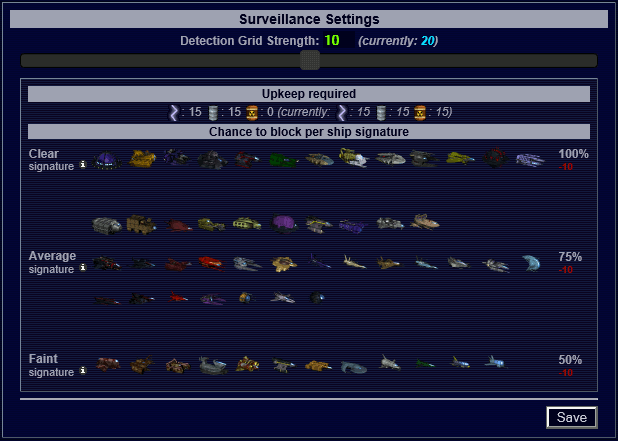 These modifiers are added together and added to the block chance calculated from the surveillance grid strength and ship type. Once a ship is either blocked or managed to fly by the MO undetected, passage for that ship remains closed or open at that MO for 24 hours. Logs and configurable notifications exist for ships blocked at your MOs (ship type only), ships that flew by your MOs undetected leaving only energy fluctuations (ship type only), and new players passing due to the newbie hospitability options set. MOs only start to block after the first production tick (if enough upkeep was supplied).